Mr Green Casino has recently added a new Western-themed slot from Play’n GO titled Golden Colts which is exclusive to this casino! 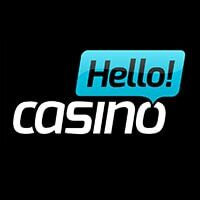 The Golden Colts slot is a collaboration of both teams and comes in the form of a 5×4 reel slot with 40 paylines and is packed with a total of 7 different bonus features with a massive 2500x bet win on offer. The base is fairly low to medium variance thanks to the number of paylines and a large number of wild symbols present on the reels. To trigger the Golden Colts Bonus Game you need to land 3 of the Skull Scatter symbols on reels 1,3, and 5 which then takes you to a “pistol bonus wheel” with different bullets that correspond to one of the unique bonus rounds on offer. During our playtests the bonus rounds seemed to trigger very frequently, although they can be a little short lived and disappointing at the same time, there are a couple of features that do stand out with gigantic symbols and huge multipliers that are capable of some decent wins. 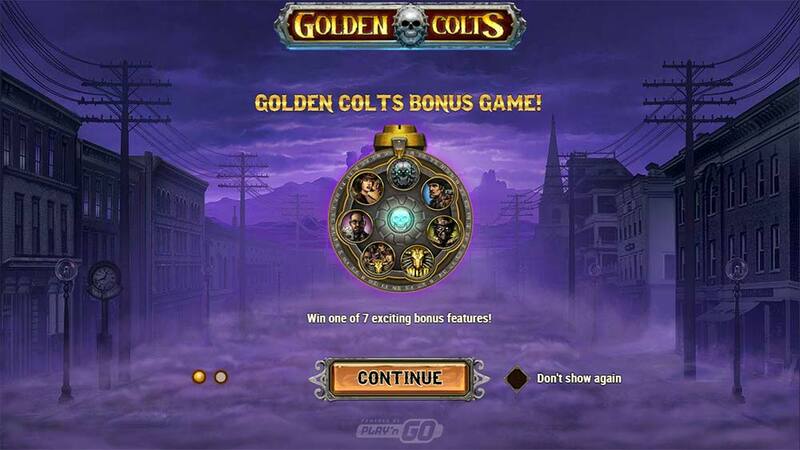 There are 7 unique bonus rounds on offer in Golden Colts, triggering these all begin with landing 3 of the Skull Scatter symbols on the reels which then leads to the Golden Colts Bonus Game where 1 of the 7 features are randomly awarded. 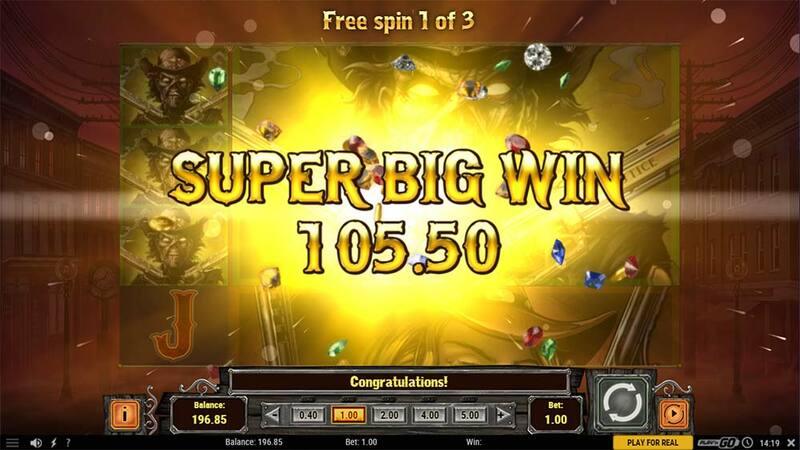 Ace-high Gang – 3 free spins with 4×4 sized gigantic symbols. 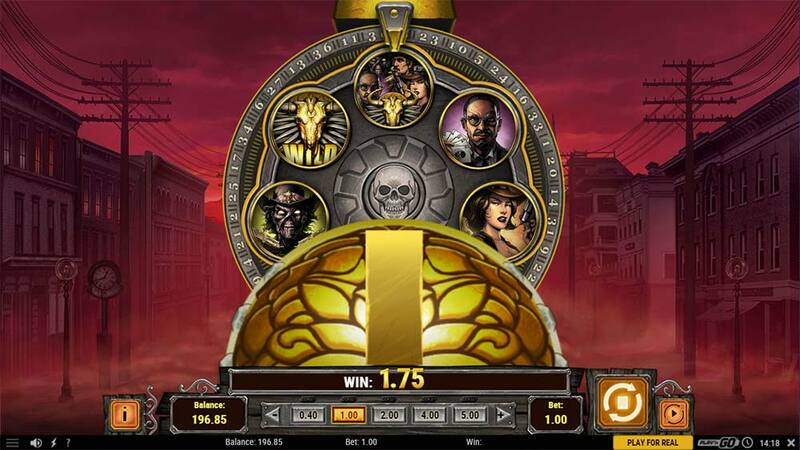 Wild Bull – 3 free spins with 1 or 2 entire reels covered in wild symbols. Law of the Wild – 1 Free Spin with stacked Sheriff symbols and re-spin potential. 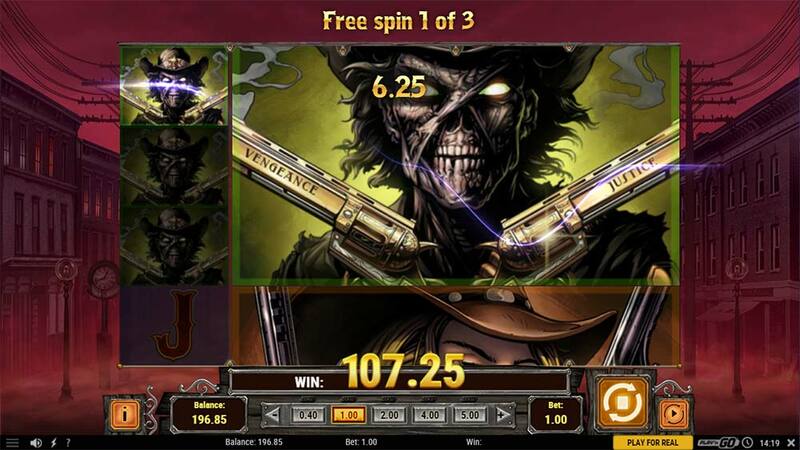 Gunslingers – 1 free spin with a random multiplier in the range of x5 up to x30. 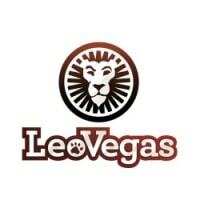 Poker Play – 1 free spin with a large Gambler symbol, additional Gambler symbols that land in view are held and a re-spin is granted. 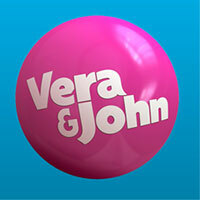 Furies – 1 free spin awarded with 2 large Girl symbols, sticky symbols and re-spins until a win is formed. 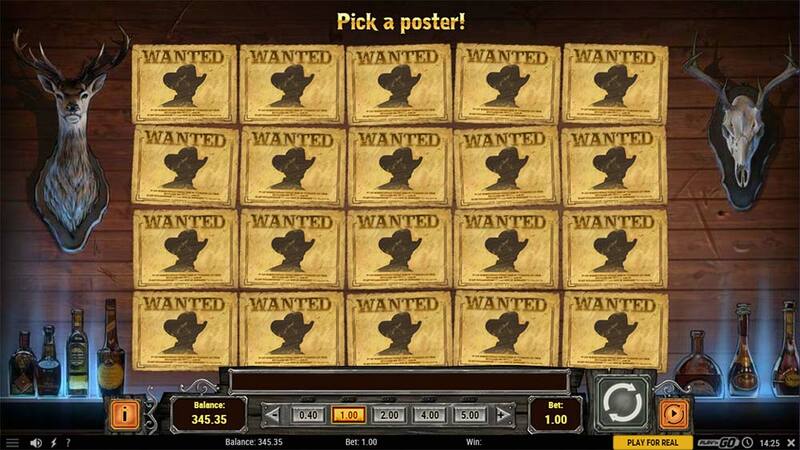 Most Wanted – Bonus Picking round with 20 posters, reveal hidden cash prizes and any of the feature above. 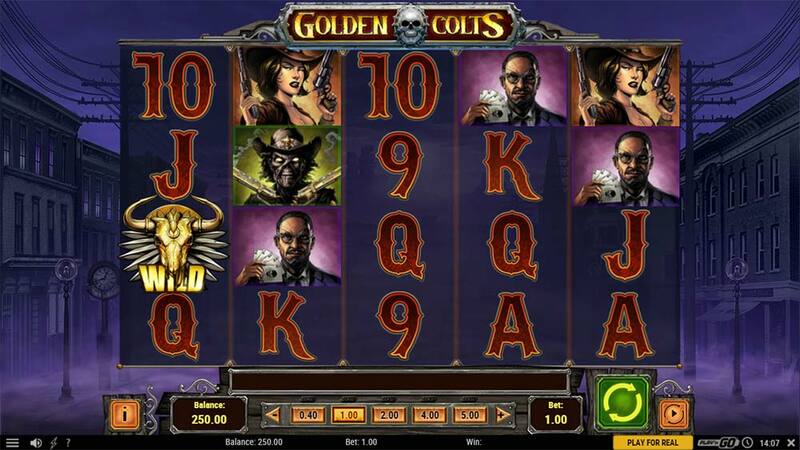 Golden Colts is a decent release from Play’n GO and Mr Green at an exclusive slot as generally in the past these “exclusives” from other providers have tended to simply be re-skins of older slots. The range of different bonus features is impressive, although with some only granting just 1 free spin they can be quite disappointing, rounds like the Most Wanted can reward you with coin prizes as well as further bonus features with a max win of 2500x stake on offer. In our playtests, we did manage 1 bonus round win over 100x stake, but generally, the end results were in the lower ranges with frequent but lower wins rewarded. If frequently triggering bonus rounds and steady base game wins are what you enjoy then Golden Colts will most likely appeal.